I was wondering what proportion of people have middle names, so I asked the Census. link or paste it into your web browser. What proportion of people have middle initials? Bureau collects data. We are sorry we were not able to assist you. Since they didn’t know, I looked at students at a university. Cornell University email addresses can contain two or three letters, depending on whether the Cornellian has a middle name. I retrieved all of the email addresses of then-current Cornell University students from the Cornell Electronic Directory and came up with this plot. 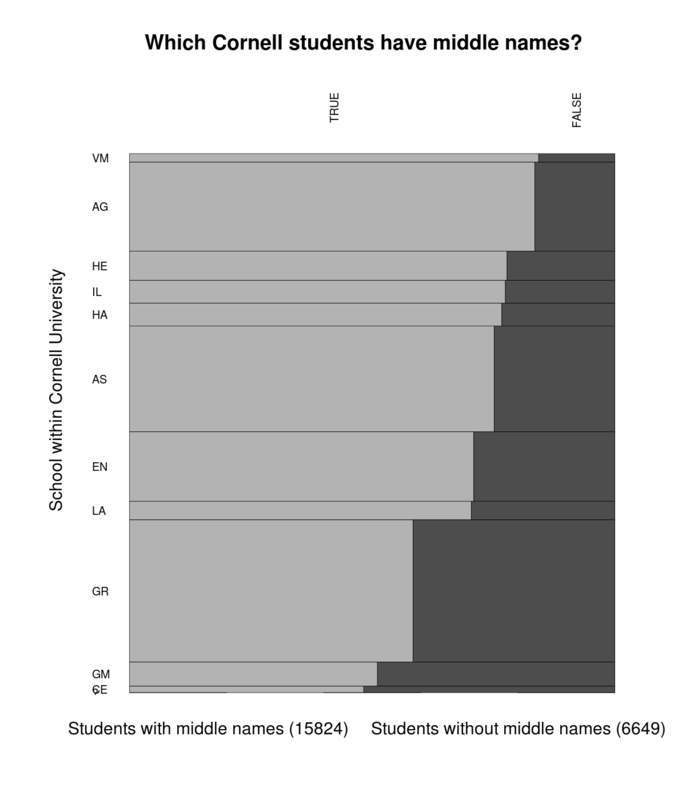 Based on discussions with some of the students in that census, I suspected that students underreport rather than overreport middle names and that the under-reporting is generally an accident. A year later, I finally got around to testing that. I looked at the names of 85,822,194 dead Americans and came up with some more plots. The rate of middle names these days is about 90%, which is a lot more than the Cornell University student figures; this supports my suspicion that people under-report middle names rather than overreport them. 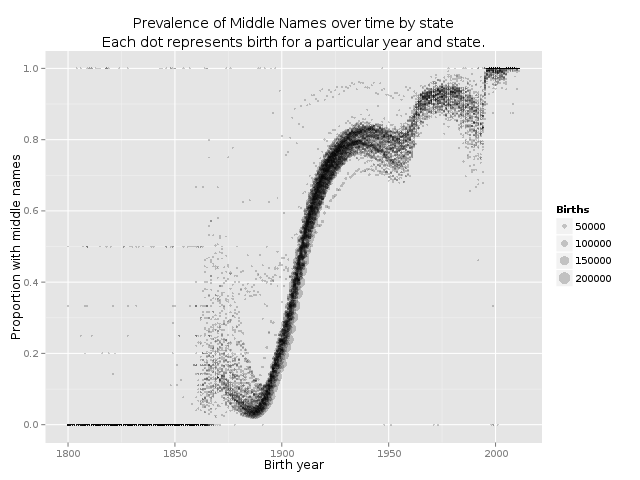 I was somewhat surprised that reported middle name prevalance varied so much over time but so relatively little by state. I suspect that most of the increase over time is explained by improvement of office procedures, but I wonder what explains slower increases around 1955 and 1990. The death file provides a lot more data than I’ve shown you here, so check with me in a couple months to see what else I come up with.